Brutal honesty: Maneka Gandhi says she won’t work for Muslims if they don’t give her votes. She just broke the hypocrisy mould! Maneka Gandhi says we can't be expected to behave like Mahatma Gandhi. Is she India's first politician to admit politics is a transaction, plain and simple, and there is no emotional idealism involved? Maneka Gandhi, BJP candidate from Sultanpur, has shown the gumption of being absolutely and honestly apolitical by telling her voters the truth, plain and simple and with no fancy toppings — either Muslims should vote for her or not expect any work to be done for them when she is elected MP from Sultanpur — a victory she has no doubts about. “I have already won this election, now it is for you to decide,” said the BJP leader on Thursday in Sultanpur. A three-minute clip of her speech in Sultanpur's Turabkhani area is now being widely shared on social media. 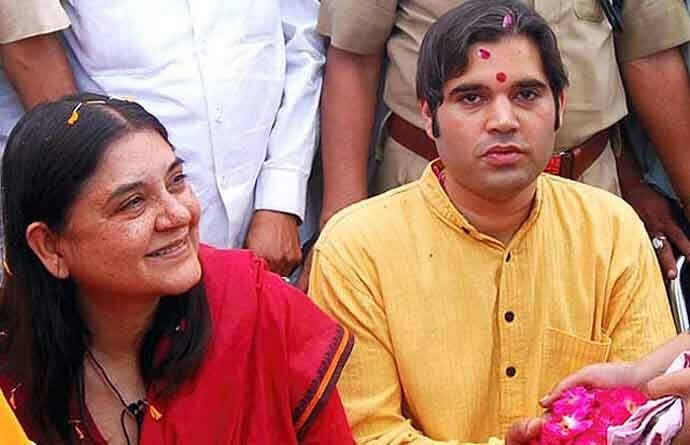 The Sultanpur seat was held by Maneka’s son, Varun Gandhi, until 2014. The party has, however, fielded Maneka from the constituency this time — with Varun shifting to her earlier seat, Pilibhit. Maneka’s brutally honest admission of how she plans to work, despite its shocking resonance, should actually be welcomed because this, in fact, helps the voter decide about what s/he wants. So, people who do not vote for Maneka must know they would be discriminated against and should not waste their time lining up outside her office, seeking anything from the MP, because if they didn’t vote for her, why should she work from them? This is her logic, clearly and openly stated. Having married Indira Gandhi's younger son, Sanjay, Maneka does have a 'Gandhi' added to her name, but then, what’s in a name? By Maneka’s own admission, she is no direct descendant of Gandhi ji. To expect her to behave like the Mahatma would be foolhardy, particularly on the part of those who dare not vote for the MP. It is also clear from Maneka’s speech that the only people who will be discriminated against are Muslims. Hindus, Christians, Jains and Sikhs can do what they want because Maneka is winning anyway. It is quite obvious that not all Hindus or all members from any community in Sultanpur will vote unequivocally for Maneka. But, going by her speech, she will not feel good about her victory if the Muslims don't vote for her. And here, Maneka’s honesty is commendable, for finally, there is a neta out there who cuts out the sweetie-pie lies, the embellished bunkum, the soft-served solicitiousness, all of which are promptly forgotten once the election is over. Here, Maneka has broken the netajis' hypocrisy mould by speaking her mind — and making her intentions plain — straight up, with no fancy lies. It doesn't sound good — true. But often, the truth doesn't. It will help now if all leaders take a cue from Maneka Gandhi and tell us clearly not just what they will do if we vote for them — but also, what to expect (or not to expect) if we do not vote for them. Let's have some truth, brutal though it is. Enough of the true lies.